Anyone following the large law firm marketplace knows of the impending demise of another big law firm. This time it's Dewey LeBoeuf, the several-year old combination of Dewey Ballantine and LeBoeuf Lamb Green & MacRae. At the time of this writing the firm is not, technically, dissolved. But by the end of this week some action or combination of actions by the firm's bankers, creditors, partners or departed partners will put the final nail in the coffin. Yes, large law firm lawyers earn a lot of money, and yes we have an oversupply of large law firm lawyers, but it's nonetheless extraordinarily sad when law firms implode. Presumably, the remaining partners, even those who haven't yet found a new home, have saved enough money over their careers to tide them over until they join a new firm. But it's a terrible and swift blow to the many staffers and associates who almost overnight will be left without a paycheck, probably without health insurance, and perhaps even stripped of some portion of retirement funds. I've had multiple conversations with large law firm lawyers in recent weeks about this episode, and without exception all feel their firm is uniquely situated, collegial and immune from the sorts of shenanigans that led to Dewey's demise. Sadly, this isn't true. I don't have specific insights into this collapse, as the firm is not and has never been a consulting client of mine and I'm not privy to its banking or financial records. As a vendor, some years ago I did engage in a protracted and messy negotiation with the Executive Director when he was in a senior role in a prior firm, and my primary takeaway is that his extraordinary arrogance masked his limited intellect. Still, one blithering idiot who has bullied his way to a position of influence isn't typically enough to take down an entire large law firm. So what are the likely and repeatable root causes of such a debacle that other law firms should monitor? When it comes to law firms, bigger is not necessarily better. Sometimes it's just bigger. Dewey's now embattled chair offered a revealing insight when justifying the Dewey and LeBoeuf merger, insisting that the firm needed to get bigger to compete in a global economy. I spend a lot of time educating law firm partners about the fundamental financial drivers of their law practice, and I've learned that many are unaware of the hard cap on revenue that the hourly method of billing imposes. At any point in time, I can calculate the firm's maximum potential revenue by multiplying the number of timekeepers by their established hourly rate and then multiply this result by the available billable hours. From this max total, we start deducting unbilled time, unrealized billings, overhead and expenses, interest lost through slow collections, and so on, until we derive a final profit, which we divide over the number of equity partners to find the much heralded PPeP (profits per equity partner). Given these constraints, most law firm leaders believe the primary way to increase revenue is to increase the number of timekeepers. But savvier leaders know that revenue is not the same as profit, and there are more lucrative approaches to generating profit than by taking on the huge overhead associated with adding timekeepers through a merger. (For example, embracing alternative fee arrangements that ensure a project fee while reducing the cost of legal service delivery through better project management.) If the goal is to generate profits -- which is a lesson every MBA student learns on day one -- then firm size is just one of the many factors to explore. An examination of numerous law firm combinations that were predictably dilutive suggests that the real catalyst for growth was ego and a poor grasp of what drives profits. Owners should own, workers should work. In my consulting practice I spend a lot of time reviewing practice group strategy and finances, and quite often I'm advised not to share these confidential data with partners (partners!) in these practices. It's startling how many law firms still embrace a closed system in which many if not most of the partners are excluded from the financial operations of the firm. In today's modern large law firm there is a distinct prestige associated with the title "partner" but in many cases the underlying fiduciary responsibilities of the partnership business form have been lost. In fact, as Dewey's situation has revealed, many partners are quite content to not get involved in administration and prefer to merely pocket a rich paycheck, which is a shocking abdication of their fiduciary responsibility and poses a significant risk -- if not to the firm, then to their personal net worth! So why kid ourselves that every pre-eminent lawyer should also have a vote in the firm's operations. There's a much simpler approach: When a lawyer has achieved a certain level of success, give him or her the title of partner and provide a rich compensation package that includes profit sharing, but leave firm management to those qualified to do so, or at least those appointed or elected to the role. There should be far more lawyer employees and far fewer law firm owners once a firm reaches a certain size. Why lawyers adhere to the inefficient partner business form when there are other options offering the same tax and liability benefits is baffling. Some will argue that the non-equity partner approach has been tried and has failed, but in its prior incarnation it was merely a tool to recruit worthy service partners and not a shift in governance. Building, leading and sustaining a successful business shouldn't be confused with falling first in an avalanche. Law firm leadership is hard. So is law firm management. Nothing reveals management incompetence moreso than watching the flailing that occurs when a business enters a new and predictable phase of the business cycle. Corporations are not immune: many founders have had to give way to experienced managers once a certain scale is reached, and others who have successfully led in boom times are incapable of making tough decisions in bust times. 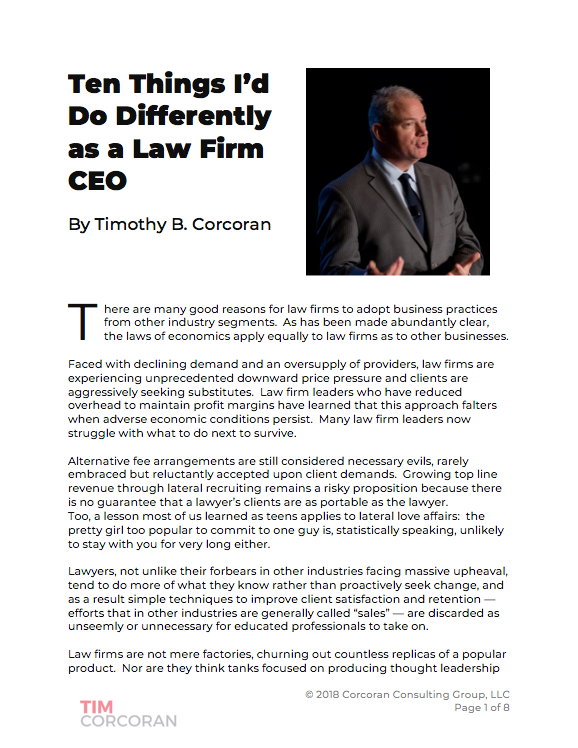 It takes different skills to to manage a law firm when demand is no longer a constant, when unfettered pricing discretion gives way to increased buyer leverage, when critical raw materials become commodities, than the traditional political and consensus-building skill set of past law firm leaders. I held an in-depth one-on-one conversation with a newly-elected law firm chairman several years ago in order to help him write his remarks for an upcoming all-partner meeting. He had no platform, no strategic plan, no vision for change, no understanding of the firm's financial position beyond the annual report highlights and he was elected after a contentious and lengthy process in which multiple more qualified but polarizing candidates were unable to garner sufficient support. So his greatest asset, apparently, was that he was disliked somewhat less than others. And yet this chairman enjoyed a couple years of success, years that looked a lot like the years prior to his arrival, and probably similar to what would have happened had the firm's partners elected a potted plant to the role. Until the economy collapsed and he floundered helplessly. A ceremonial position riding the tide of a generation-long run of near-unlimited demand for legal services is distinctly not what is needed today, and this applies at both the firm and practice group level. Rather, leaders must be "consciously competent" and know why the firm or practice is successful, what levers and options exist to sustain or generate growth, what pitfalls or costs are associated with each alternative and the risks posed by the competition -- traditional and non-traditional. It's not "too big to fail," it's "too big to trust." An unwritten but assumed aspect of the partnership business form is that partners, by and large, know each other and consciously choose to throw in their lot and do business together. As law firms have skyrocketed in headcount, it is literally impossible to know every other partner, certainly not at a personal level that leads to mutual respect and trust. If that were true, partner meetings would have 100% attendance, cross-selling would come naturally to those who want their colleagues to succeed, sharing client contact information and evolving single-engagement clients into firm institutional clients would be automatic. But what every law firm implosion has shown us is that many partners have joined a firm in order to benefit from the brand strength, but have no interest or incentive in sharing clients or helping the firm as a whole succeed. Too many partners "protect" their clients in order to retain maximum portability should a better offer materialize elsewhere. And this lack of a common bond poses a challenge in a troubled business climate when the bankers come calling and ask partners to provide personal guarantees to secure lines of credit. As one DC-based partner spat upon learning he lost an industry accolade to a NY-based colleague, "I'll be damned if I work with let alone congratulate that overpaid clown." You don't have to like all of your partners, but if you don't trust them enough to effectively cross-sell and collaborate to your mutual benefit when times are good, the likelihood of standing shoulder to shoulder to face a common threat when times are bad is non-existent.